The ability to communicate a clear message, and deal with questions from the media, is now a vital skill for almost any Chief Executive or senior manager. Yet many in the business world fear the media. Instead of seeing an opportunity they seem to be much more worried that they will be misquoted, and believe reporters’ only aim is to catch them out. 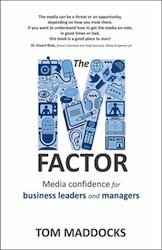 That is why I have just written a new book called The M-factor: media confidence for business leaders and managers, just launched and now available on Amazon. This highly practical, down-to-earth book reveals the secrets of how to understand the media mindset, know what journalists are looking for, give a good press or broadcast interview, deal with a crisis, and understand the impact of social media. 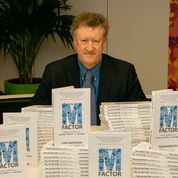 In short – how to get The M-factor. The book will tell you everything you need to know, from the seven big mistakes made by companies and their spokespeople, to the art of creating a great sound-bite. There is sound advice on how to shape your message effectively, respond to difficult questions, get the style and tone right, and deal with a media crisis. In the wake of recent botched crisis handling by food companies over the horsemeat scandal and the Liberal Democrats over the Lord Rennard affair, I hope the book is very timely. It should provide a great companion to the media training that company spokespeople always need to ensure they can put it all into practice, and deal with questions ‘under fire’.